Michael Johnson a senior at C.R. 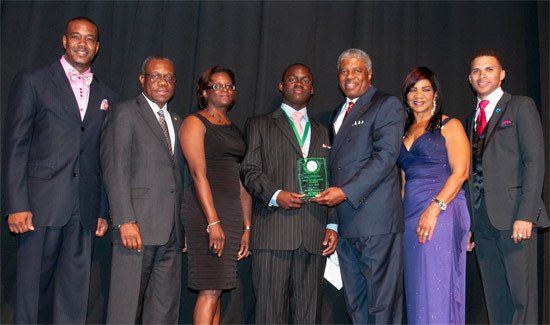 Walker Secondary High School and achiever of Commonwealth Bank was awarded the 2014 Junior Achievement (JA) New Providence Most Distinguished Achiever (MDA) at the JA Awards held at The Atlantis Theater, May 10. The MDA title is 35 years old and the recipient receives a full 4-year scholarship to The College of The Bahamas. Recipients of this award over the past 35 years include attorney Wayne Munroe, banker Elena Mortimore, Dr. Valron Grimes, Philip Simon, fashion designer Theodore Elliot, accountant Jerry Butler and sales executive Ashley Evans. Pictured are Philip Simon – Vice Chairman and Acting Executive Director of JA Bahamas, Felix Stubbs – Immediate Past Chairman of JA Bahamas, Deborah Symonette – JA Board Director, Michael Johnson, Raymond Winder – JA Bahamas Chairman, Mavis Burrows – Sr. VP Operations Commonwealth Bank and Darron Turnquest – Director of Youth in the Ministry of Youth.